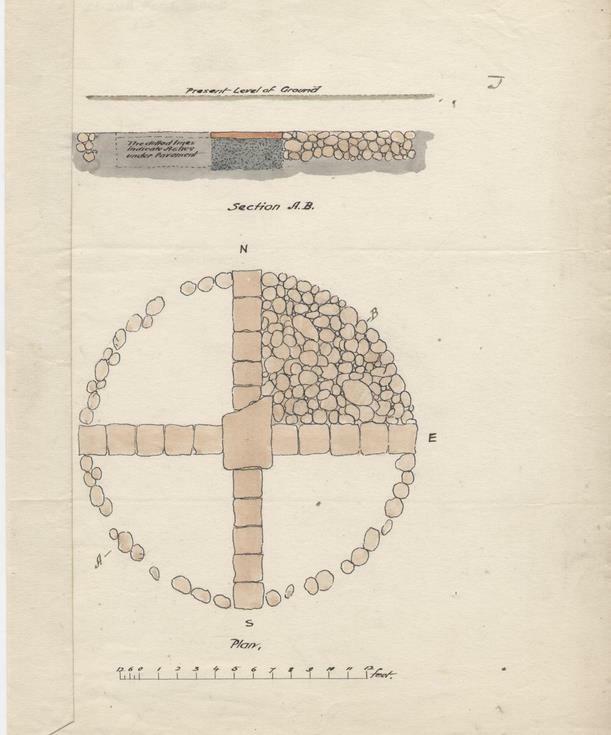 Notes on a structure found at Dunrobin in 1879 with accompanying sketch. Full text: "The accompanying sketch, with sections favoured by Mr Bisset, represents what may have been a place of human dwelling or sepulchre which I came upon while laying out the new hardwood nursery at Dunrobin 1879, but it had evidently been dismantled long before our operations began, singularly enough there was a large granite boulder placed immediately above the Circle indicating the spot under every pavement which all remained intact, contained under them separate beds of charcoal ashes, the pavements were all excepting the large one, a good deal worn, caused either by foot-traffic or otherwise had been in the bed of a river and worn smooth by the action of the water on them. One of the segments of the Circle had been filled in with pretty large boulders, very probably from the outer wall of the circle when dismantled, as there was only a limited number round it and by no means regularly placed, the other segments contained earth only with a few flat stones of the district mixed with it. In several parts of the nursery I found flat stones from five to two feet with ashes under them but found nothing to indicate in bones or other relics that cremation had been carried on those days. N. Baxter Dunrobin 6th July 1880"